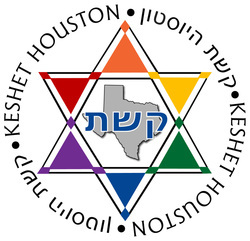 Keshet Houston, Inc., is a nonprofit organization and depends on the generosity of its supporters. Sponsorship of our entry in the 2018 Pride Houston parade. Online services, including website hosting, URL registration, and email services. Making Jewish holiday celebrations free for all who want to participate. Or mail a check or money order, payable to "Keshet Houston" to P.O. Box 920552, Houston, TX 77292-0552.